The amusement park was always a great place to get together. Kids, teenagers, and adults alike all had reasons to be there. Sometimes Claremont students came here for a field trip, and it was a fun experience every time. It was different for Ashley today. Normally she never comes here, this was her second time. It was also different for her in that she would be going with Blake today, on a "date" of sorts. While this may not have been a problem, somehow Blake had convinced her to go in their superhero forms, something Rycon never liked to do in public. KC landed right next to her. He had clearly been doing some shopping. Although he had to pull a few strings, he had a custom costume made to fit him comfortably. The base material was morphic molecules, which fit comfortable over his small frame. Although a few muscles stood out on his arms, Blake had been working out at the gym in Claremont. The costume itself was black, but there were green highlights on the sides of the torso and going down his arms. He decided to keep his old insignia, and the Elder Sign was in the center of his chest, in green. On the right shoulder of his costume, he also had "KC" written in green. The second thing that was obvious was that he decided to invest in a cape. It went down to his ankles, and fluttered behind him. It was a pleasant shade of forest green, and had a large Elder Sign in white on the back. "Pretty cool, huh? I thought the cape was a nice touch. Much more comfortable than that bodysuit I used to wear. I felt like a diver. Anyway, shall we go in?" he said, walking towards the entrance. Rycon wasn't really trying to completely hide, so she wasn't surprised that Kid Cthulhu found her. The new costume however, was a welcome sight. She never liked the bodysuit on him. "Interesting fabric, How did you get it?" she asked as the two made their way to the entrance. The men in the entryway had looks of shock, unsurprising really. The two heroes would have been kicked out had not some of the workers remember KC on the scene during a museum heist several months back. With a few minutes of understanding, the two were let of free into the park. Rycon felt embarrassed beyond belief. It was perfectly understandable that people would give stares to the heroes. Not wanting to waste any time standing, Rycon asked KC, "So... this is my second time here. How often do you come?" KC smiled at her. "The fabric is apparently really popular with heroes these days, it's some kind of advanced sciency polymer that I can not comprehend. But it looks okay, I hope. Just wanted a more superhero-like costume." As they walked, KC breathed in the air. The familiar smell of cotton candy, fresh hot dogs, and frying funnel cakes filled his mind with memories. "My parents used to come here as a kid. They said it helped them relax." KC stopped for a moment and pointed. "That." he said, pointing at the Tilt-A-Whirl. "Was my favorite ride. Want to go?" Before she started reminiscing, Rycon looked at the Tilt-A-Whirl with a rather nauseous look. While her training throughout her years may help, overall she wasn't exactly ready for such an extreme ride like this. Her attention was suddenly directed towards two kids, around 8-10. One male, the other female. The female seemed reserved while the boy was much more talkative. "Hey look!" he cried out happily. "You're the squid that saved the museum!" The girl, quietly walked up to KC, raising her hand to touch one of his tentacles. "Oh!" she said, rather frightened, if quiet. "They're... real." KC laughed at the little girl's reaction. "Yep! It's true. I'm really half-squid. I'm glad I could help the museum, it's a really fun place for me. Plus, it's kind of my job." KC said as he stood in what he imagined was a heroic stance. "And this, is Rycon. She's a superhero too." he said, gesturing to her. He knew he was embarrassing her, but she would have to deal with it. The young boy seemed ecstatic to be near KC, while the girl seemed to open up a little more. "Um... I'm Marcia," the young girl said, "And this is Davis." The boy, Davis, also tried touching KC's tentacles in amazement. "Awesome! How do you eat and drink with these?" the boy asked, while Marcia more politely questioned, "Where did you come from? How old are you?" Her questions seemed more mature than the Davis. Meanwhile, Rycon watched next to KC. She saw the boy and girl, with jealousy and pity respectively. The boy was everything Ashley wished she could have been. Outgoing, courageous, without fear or worries. And the girl was everything that Ashley was. Quiet, reserved, not willing to take risks. It was a bit difficult for Rycon to watch, seeing what she is and what she could have been. KC's gesture to her left her a bit lost for words. The only thing she said (and wanted to say) was, "Hello," and left it at that. The kids seemed more interested in the squid anyway. KC noticed Rycon's lack of enthusiasm quickly. If there was one thing he wouldn't have, it was her not having fun. This day was supposed to be about them, not a publicity stunt. But he wanted to answer the kid's questions, just the same. "I can eat and drink with these pretty easily. See, when I say the magic words, I can change back into a human again!" He was hoping his description would make the kid happy. "I'm sixteen years old. I'm a kid just like you, but an older kid. I still try to be a kid at heart. And I'm from Freedom City, just like you!" Although he was greatly amused by their curiosity, he needed to talk with Rycon. "We've got a big day ahead of us! Stay in school, kids!" he said. Not interested in speaking, Rycon simply waved goodbye as the two walked off. "Sorry. I was watching that girl and..." Rycon paused as she turned to see the two kids saying goodbye. "The girl, Marcia, is so much like me. It was like I was viewing a mirror. She took a sat on a nearby bench as she sighed, looking at the ground before continuing, "Seeing her so shy had reminded me of my days back in Germany, where I was used to demonstrate my lightning abilities. I often made scientists laughingstocks when they couldn't figure anything new about how my powers originated, and other scientists came to try, only to repeat the cycle of humiliation. It was an ordeal for everyone, those were hard years to pull through." She spoke in a quiet tone. She looked to KC, saying, "I wouldn't have kept any sanity during the time there if it weren't for my parents... and Dr. Archeville." KC listened to her story and nodded. He remembered the tough times with his family too, when they didn't earn enough to pay the bills and they had to live on almost nothing. That wasn't close to what Rycon had to deal with. He sat down next to her, and put his arm around her shoulder. "You know I'm here for you, Rycon. I may not have known you for very long, but you can always talk to me." He hesitated for a moment before continuing. "Umm, would you like this date to be as Blake and Ashley instead? To be honest, I'm kind of feeling silly in this costume without any evil-doers to fight." Rycon gave a smile on KC's words. Even though they haven't known each other for long (about a month now), he had always looked out for her. It seemed unnatural though, KC is already trying to go to boy/girlfriend levels in such a short amount of time. Rycon didn't understand a thing about a romantic relationship, but in her mind, she thought that KC was a great guy to be with. "Thanks. I will." She wished she could say KC's real name right now. "Oh, you want to change back already?" Rycon's attitude changed back to it's normal self. "Alright, look for a safe place, I'll be right back." She made her way to the woman's restroom, where she started removing her stuff and placing it back into her backpack. KC watched her leave. He really was glad to be spending time with her. Luckily, he didn't really need a restroom to change back. He saw a good spot- behind the vending stands. He walked casually behind the stands, and whispered the magic words to himself. 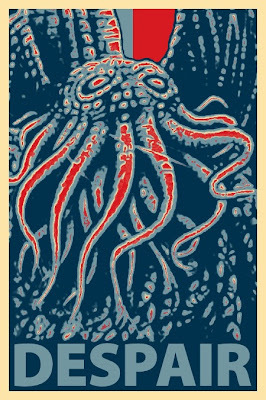 "Cthulhu f'htagn." and in a slightly less dramatic burst of eldritch flame, KC was back into his human form, the rather average Blake. Today he was sporting a black T-shirt (as usual) with a parody of the famous rendering of a politician. He was also wearing his favorite leather jacket, and black Converse sneakers. He sat back down at the bench and tapped his shoes against the boardwalk as he waited for Ashley. Ashley felt better as she walked out of the restroom. It was nice that she didn't have to wear her costume in public when she didn't need to fight. She saw Blake sitting on the bench they were at a minute ago, wearing a rather questionable shirt. Ignoring the shirt, Ashley walked up to Blake and said, "...Shall we go?" While Ashley fared much better when talking with friends, she still had a little difficulty speaking her mind to anyone. As they walked a little, Ashley looked over to the Tilt-A-Whirl. "Um... Shall we get on the ride?" she asked Blake. Despite knowing she would regret it, it wouldn't have any long-term consequences to go on it once, would it? "Blake, do you ever get nauseous nowadays?" she also asked, seemingly out of the blue. He walked along with her. "Yeah! It's a ton of fun, trust me. But no, surprisingly, I don't really get nauseous anymore." He was glad to be back at the park again, and riding the Tilt-A-Whirl would complete the scene. "C'mon, Ashley! But if you do decide to barf, please face away from me." Blake said with a huge grin. He grabbed her hand and led her to the ride. "Uh... Alright," Ashley commented in doubt as the two went on the ride. True to it's name, the Tilt-A-Whirl allowed the circular seats to spin 360 degrees while the ride slowly tilted 90 degrees and back. It was one of the more enjoyable, if dizzy moments the German teenager has had. Getting off the ride, Ashley said, "Let's have a rest, I'm dizzy." She took a seat on another nearby bench. Ashley almost felt like throwing up, it was all a new experience for her. She turned to Blake, who was sitting beside her. "So Blake... I heard that you're quite an artist." Her voice was a little shaky due to the ride. "What kind of drawings have you done?" Blake's head was spinning from the ride, and he was dizzy, too. "Well, I like to draw whatever I can find. Nature, people, animals, anything. I also draw famous superheroes. There are enough pictures in library books to get a good idea. Other than that...whatever pops into my crazy head." "What about you, Ashley? What do you do for fun? Ashley thought for a moment before answering, "I don't do much else aside from crafting. Before I came to Claremont, I made stuff out of metal like knives, armor, utensils. I have my welding class to thank for that." She thought for a moment, "Let's get something to eat." The two teenagers decided to try the cotton candy there. It was weird to eat for Ashley. "Blake, is this what's it like to eat a cloud? Have you actually tried eating a cloud while flying?" she asked as she bit into the cotton candy. It was rather sweet, where Ashley thought such a thing would be flavorless. The wonders this city held was limitless to Ashley's eyes. "Blake, what other exotic foods does this place have?" Blake laughed aloud. "Cotton candy's just sugar. The food here isn't exotic over here, they've got your basic theme park food...hot dogs, soft pretzels, popcorn, and funnel cakes. It's all tasty, but none of it's good for you. But theme parks are supposed to be about having fun, not eating well." Blake thought about putting his arm around her shoulder as they ate, but thought against it. Not yet, anyway. "What kind of food do they serve in Germany?" "Oh... It's sugar? She asked in surprise. hesitating a bit, she kept eating, deciding to go with Blake's philosophy of having fun at amusement parks. "We don't have this in Germany. To say the least, Bavaria, the place I am from in Germany, is one of the more renowned states due to it's great value and selection of food." She paused a bit before continuing, as if not trying to gloat about her home country. "Bavaria has some foods that are unusual to Germany, like white sausage." She finished her cotton candy and threw it in the garbage before continuing. "My home state was also known for it's wine, in part thanks to the Franconia wine region. We often have wine festivals throughout the year, not that I have attended any." No longer feeling dizzy, Ashley stood up. "I think I'm better now. Is there a ride you like that isn't as extreme as that last one?" KC stood up and stretched. "There's always the merry-go-round. That's a lot less extreme." He pointed to the carousel across the way. He hoped she would like that one, he was always a fan. Although he preferred the crazier rides, to be fair. He walked alongside her, and almost went to hold her hand, but once again hesitated, and decided against it. Not yet. "So what did you do for fun in Germany, Ashley?" Ashley had a look at the merry-go-round. It did seem more casual than the previous one, perhaps too much so. "I should be more specific... she said downheartedly, "I don't really mind the spinning, I'm just uneasy when sideways or upside-down." They passed the ride as they kept looking for another one to go on. And yet, Ashley felt that she needed them to know about it. She couldn't hold off on her past forever, it would have gotten out eventually. After a moment, Ashley continued her past. "There were only two things back in Germany that were enjoyable. School, and Dr. Archeville..."
Blake walked with her, and listened with a solemn face. He was sure this was something she had told to more than one person. "Are you sure you want to talk about this? If it's painful to think about, we can just discuss it another time. I don't want you to talk about painful memories, Ashley. I've got a few I haven't told anyone about, and it hurts me to think about them." Blake thought about the book, and what it did to his parents. What could have happened to him. Ashley had a bit of an emotionless face as she spoke, "Please, don't worry about it. I'd like to talk about the positives now." She started walking again, "Let's find a quiet place to talk." The two went to a nearby place in the park. It was a lush place in comparison to the other areas. Trees and flowers were planted and carefully raised while the grass walkway was spot-clean and easy to walk through. The two teenagers sat down on a nearby bench, licking off ice cream that was on their lips. After a moment, Ashley began speaking. "I found school like a haven in comparison to labs. The other students were so curious about me, since I was in 5th grade when I arrived, without any indication of me being from another school." She paused to close her eyes, remembering her time in school. "I remember it... vividly. Students were gossiping about how mysterious I am, they tried to act like friends to figure me out. They never did." Ashley's voice started to lighten up, "The best part there was the teachers. They... respected me, trusted me that I was uncomfortable with other people. They were the reason I was able to pull through each class. She opened her eyes, the lush scenery hit her like a sweet aroma. She turned to Blake, "Do you know Dr. Archeville, over in Hanover? Blake sat with her and listened. "I've heard of Dr. Archeville, yeah. He's that famous scientist, right?" As Blake was with her, he noticed the trees and the grass too. It looked very picturesque, and he made a mental note to come back and make a drawing of the landscape. He closed his eyes, and breathed it all in. The smell of nature, the grass, the trees, and Ashley's perfume. He tried to think of something to say that wouldn't be stupid or insensitive. Blake breathed a sigh, looked at her, and said "At least it's all over now. The testing, the words behind your back, it's over. And I'm glad you came to Freedom City, Ashley." He smiled at her, and put his arm around her shoulder. Ashley gave a sweet sigh. "Dr. Archeville was one of the scientists that worked with me back in Germany. Not 'on', 'with'." Her voice was a quiet hummingbird, as if not to catch attention. "He was like my father, but with more understanding." She leaned back on the bench, looking up into the sky. It seemed a bit irregular today, but that didn't matter for Ashley. "I met the Doctor a year and a half before I left Germany. What he had was amazing. Such high-tech equipment, he could use it to pinpoint every vein in my body." She could remember the more pleasant tests that Dr. Archeville performed. No prying eyes, no media, just complete solitary with the two. "I learned much about science from him, and he learned much about me in the process." She thought about the odds that the two met together again. "It seemed rather implausible that we had met again, much less have a job at his company." Ashley brought another smile to the world. "Blake, would you like to meet the Doctor one day? He talks on and on how magic is just an delusional term to describe supernatural abilities." She turned back to Blake, her smile turning from joy to smug, "I'd like to see if the Doctor could find out how your powers are 'science'."